Deaf dog: Valentine is a one-year-old Jack Russell Terrier who was born deaf. He's a rescue. Other pets: Emma, a Jack Russell Terrier; Jack, a Pembroke Welsh Corgi; Elvis, a three-legged mutt. Deaf dogs: Sparkles, a 4 year old Dalmatian, is very sweet, gentle, and loving. Bealer, a three year old Catahoula. According to his mom, Bealer is "a big marshmallow." 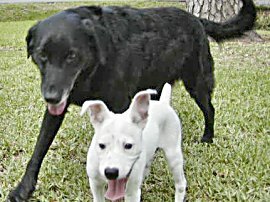 Other pets: Snickers, a chocolate Lab; Daisy, a Jack Russell Terrier mix; Piggle, a Boston Terrier. Deaf dog: Reno is a 4 year old Dalmatian. "Reno came to me a week ago from a loving family who has had him from birth. I have never owned a deaf dog so this is a learning experience for me. Reno is smart and so very loving. I am trying to learn all I can to help him and help myself to communicate with him. I will always be grateful for the blessed gift of Reno. He is just what my son and I needed." Other pets: Coco, a large lab who does not get along with Reno; and Chaka, a little chihuahua who wonders why another dog is in the house. 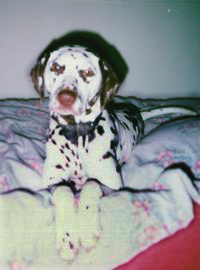 Deaf dog: Mischief is a 6-1/2 year old Dalmatian. "I received Mischief five years ago and have never looked back. The people that gave her to me forgot to tell me she was deaf, they actually said she had selective hearing!!! She's lived through a litter of pups, eight in all, they had her bred before giving her away. Mischief now lives with another male hearing dalmatian, 1-1/2 years old, and most of the time, you'd think she was the young one. She's a wonderful dog, I'm sure I'll always have one in my life." Other pets: Spot, male, hearing, Dalmatian 1-1/2 years old; and Autumn, male, crazy, 1 year old cat. Deaf dog: Maestro's owner writes: "A volunteer for a rescue shelter saw me with Beamer after I had gotten his nails clipped at pet store. She told me of puppy dane that was deaf and needed home or he would be destroyed. I called the shelter as soon as Beamer and I got back home then went to see Maestro; I was in tears because I couldn't fathom someone abandoning a deaf puppy. 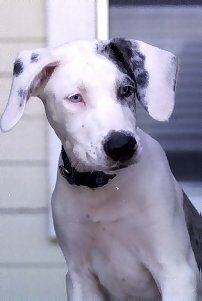 I knew if I went I could not resist getting another Great Dane. And, Maestro is now one of the "boys" in my family." Rhonda has since found out that Maestro is a Catahoula Leopard Dog. Deaf dog: Rascal is a two year old Dalmation. This is my first time owning a deaf dog, and he is a wonderful, sweet, and loving dog. The previous owners were going to have him put down. I could not let that happen to such a wonderful boy; so we took him and now he is really spoiled!! He is our boy and he knows it!! Deaf dog: I adopted Baxter (3yr old Boston Terrier) when he was 6 months old. His previous owners didn't want him once they discovered he was deaf and even talked about putting him down. I took him in without hesitation. He is the most wonderful, loving dog. He is very smart and learns signs quickly. He loves to play with his toys and my other dog, Honey. Baxter keeps Honey young. He is a little clown. I have never seen a dog with such an expressive face and personality. He loves to sleep under the covers by my feet. He is friendly to everyone. He brings great joy to my life. Please do not rule out adopting a dog because it is deaf. Other pets: Honey, 13yr old Husky/Sheepdog mix. 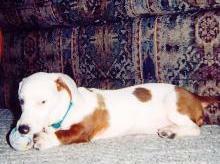 Deaf dog: Mini is a 5 month old Dachshund. "It was a shock to us when we learned our new puppy was deaf. We both cried when we realized she would never hear her name. However, we have learned to communicate with her and we know we were meant to have her. She has two older sisters that also love her. I guess the thing I want to say is that although it's hard work sometimes, it is worth it. She is smart, lovable and very much loved by our whole family." Deaf dog: Mango's human pal writes: "Mango is now 1 1/2 years old. We rescued him from the shelter when he was 9 months old. The attendants there did not know he was deaf. While I was deciding to take him home, I noticed he did not respond to sound only touch. Fortunately, he got along with my other two hearing boxers and that was it. He learns more and more every day, especially by the other dogs. This week they are working on a digging expedition to China. We will let you know if they make it!" Human companions: Andrea York and her husband. Other pets: Jazz and Lucy, Boxers; and Sidney, a cat. Deaf dog: Ava is a 12 week old Jack Russell Terrier mix. "We've just started on our journey with little Ava, but we're certain she is going to be great! When we met her at the Humane Society, it was love at first bite. She wants to learn and wants to fit in, and we're certain she will." Other pets: Zooey, a 12 year old lab; and Ms. Kitty, a 10 year old cat. Deaf dog: Lucy is a 2 year old Australian Cattle Dog. "We found Lucy (no tags) on the freeway on Christmas day, 2001. When we stopped and opened the car door, she jumped in joyfully. Partied with the other dogs at my sister's house for Christmas dinner. Came home and acted like she'd always lived here. We realized she was deaf within about a day. Have never had a better, smarter, more well behaved dog!" Human companions: Lynda Tew and her partner. Deaf dog: Dixie's human pal writes: "Dixie was the last in her litter and I couldn't pass her up because she was so beautiful, I had never seen an all white Jack Russell before with no spots. When I would come home from work I noticed that she wasn't up waiting for me at the door. I took her to the vet and found out that she was deaf, my vet referred me to Texas A & M Univ. Vet School to have Dixie's ears checked out to see if surgery could fix the problem. After the tests were ran we found out that her ear canals were under developed and she would never be able to hear. My Dixie girl is a character, she loves baths and she eats anything (especially pickles). I bought another Jack Russell named Daisy to help Dixie out, it is alot easier to have a hearing dog around the house because your deaf dog watches the hearing one and follows everything. " 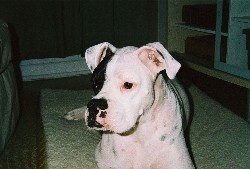 Deaf dog: Destany came to me through a rescue at 3 1/2 months old. I chose her because she was a deaf Great Dane (I work with special needs children and decided to adopt a special needs dog) and because of her beautiful blue eyes! She has only been with me 2 1/2 weeks, and we have been battling kennel cough and an anaphelactic alergic reaction so we haven't had much time to really begin our training due to health issues.